Four Conductor Solderless Lugs | 4 Conductor CMC PosiGrip Lugs | Cal Fasteners, Inc.
Specially-designed ridges on the bottom of the contact surfaces of CMC’s four conductor solderless lugs provide contact points for electrically secure joints of the lowest possible resistance for improved current flow. The clamp screws on these PosiGrip connectors are designed to extend beyond the barrel sides of the conductor, creating better, more secure compression of the conductor. This spreads the conductor strands to help dissipate heat and improve pull-out safety features and capabilities. 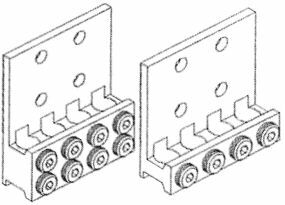 The unique wire way design provides optimum current transfer via a straight line flow through the connector that creates the path of least possible electrical resistance. Positive wire stops are also provided. Request a quote on PosiGrip 4-conductor mechanical connectors, or contact Cal Fasteners to learn more.